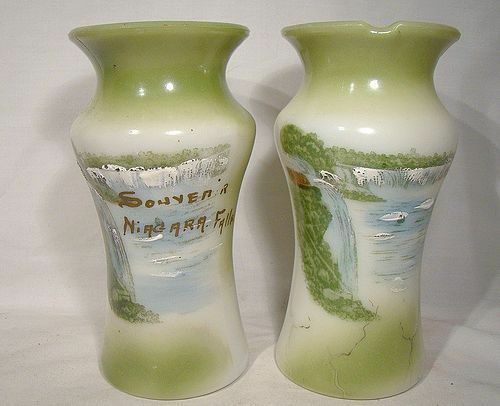 An antique pair of Niagara falls souvenir milk glass spills or mantle vases. These vintage 6" inch tall vases have sprayed-on green colour and hand painted scenes of the falls with thickly dabbed white "foam". The legend SOUVENIR OF NIAGARA FALLS is painted in gold, and these vases show the roughness, straw marks and flaws typical of such souvenir ware. The glass was usually made of stock moulds and was quickly and inexpensively produced. These vases would have been undecorated blanks originally, painted to order for a wholesaler or shop. Glass manufacturer unknown. They are in excellent original condition with no chips, cracks, losses, damage or repairs other than the visible factory flaws. Please note that the rim indentation is original to the manufacture of the vase. All items are thoroughly and conservatively graded and all condition issues are noted; all items are vintage or antique and may have slight signs of gentle use. Expedited tracked and insured parcel shipping to the U.S. starts at $19.50 (other spots may vary, air is higher). Items paid with a credit card will be shipped to confirmed addresses only. We do ship internationally. All of our prices are in $US. PLEASE NOTE: We DO NOT accept PayPal. 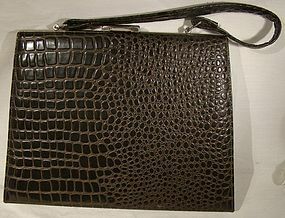 A vintage unsigned chocolate brown coloured natural alligator purse c1940s-50s. This 12-3/8" wide purse stands 9-3/8" high to the top of the nickel plated clasp and it has a 7" high alligator strap as well. it has a brown silk lining with a zip pouch and it is in excellent condition with no scrapes, wear, cracks, dents, bends, corrosion, losses, damage or repairs other than a white stain or residue on the liner inside. All items are thoroughly and conservatively graded and all condition issues are noted; all items are vintage or antique and may have slight signs of gentle use. Small packet air shipping to the U.S. starts at $15.50 (other spots may vary). Items paid with a credit card will be shipped to confirmed addresses only. We do ship internationally. All of our prices are in $US. PLEASE NOTE: We DO NOT accept PayPal. A Whitbread Tankard beer pub or bar sign 1950s-60s. This gilt metal and screen-printed plastic pub advertising sign measures 8-5/8" x 3-1/8" and it has white, gold, red and gold screening on a royal blue plastic oval, set in to a metal tripod-style base. Whitbread Tankard is an English beer, first introduced in 1958 or 1959 by the Whitbread brewery. (The Whitbread brewery is no longer in business). This bar collectible is in very good condition with no chips, cracks, dents, bends, corrosion, losses, damage or repairs other than the expected slight surface patina/scratches (exaggerated by our halogens) and minor gold rubs from use. All items are thoroughly and conservatively graded and all condition issues are noted; all items are vintage or antique and may have slight signs of gentle use. Tracked Packet shipping to anywhere in the U.S. is $15.50 - this includes online tracking, air service and insurance up to $70. Items paid with a credit card will be shipped to confirmed addresses only. We do ship internationally. All of our prices are in $US. PLEASE NOTE: We DO NOT accept PayPal. A vintage 7-1/2" high x 6-1/2" x 4" rectangular Ocean Blend Indian & Ceylon Tea tin with an unusual deep teal blue background. It has centre graphics of a steamship. 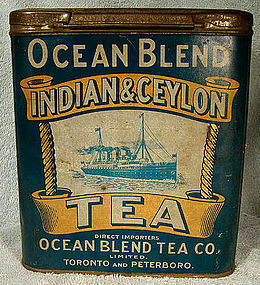 This Canadian (Toronto and Peterboro (sic) tin was manufactured by Macdonald Mfg. Co. Limited Toronto; we haven't seen one with the blue colour before. 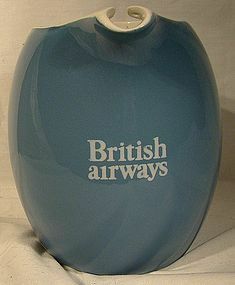 This excellent advertising piece is in very good original condition with the following condition notes: one panel and one side excellent graphics and colour with minor spotting and scrapes, one side panel scrapes to paint below TEA, other side panel spots of wear and stains/residue from masking tape (not removed), surface scraping and loss of surface to lid, small dent to edge at one side panel, and splits to rear of lid at the hinges (from surface to hinge). Lid has many use marks/scrapes. Otherwise this is a nice, clean presentable example. All items are thoroughly and conservatively graded and all condition issues are noted; all items are vintage or antique and may have slight signs of gentle use. Small packet air shipping to the U.S. starts at $13.50 (other spots may vary). Items paid with a credit card will be shipped to confirmed addresses only. We do ship internationally. All of our prices are in $US. PLEASE NOTE: We DO NOT accept PayPal, only VISA and MASTERCARD. 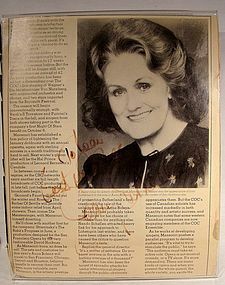 An authentic vintage 1970s autographed magazine article by Joan Sutherland (1926-2010). This dedicated signature is signed over the article and photograph "To Joan Best Wishes Joan Sutherland" in marker, and it comes with a plexiglass standup frame. It is in very good condition with some ragged edges to the paper and some minor fading to the ink. We can ship this without the standup frame if you wish. All items are thoroughly and conservatively graded and all condition issues are noted; all items are vintage or antique and may have slight signs of gentle use. Small packet air shipping to the U.S. starts at $12 with the frame, $7.50 without (other spots may vary). Items paid with a credit card will be shipped to confirmed addresses only. We do ship internationally. All of our prices are in $US. PLEASE NOTE: We DO NOT accept PayPal, only VISA and MASTERCARD. A Mauchline ware Flume, White Mountains, N.H. bank circa 1900. 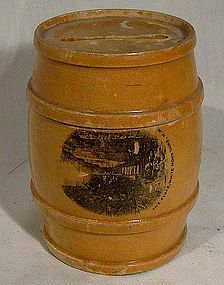 This unusual late Victorian Mauchlineware barrel shaped 3-1/8" high wooden coin bank was made in Scotland and it has a decal depicting the Flume gorge in the Franconia Notch State Park, White Mountains, N.H. (New Hampshire, U.S.A.). It also has a decal stating SCOTLAND on the back and it was made as a souvenir for the U.S. market. This item is in very good condition with no cracks, losses, damage or repairs other than some minor scrapes and varnish losses and some minor loss to the original paper on the bottom. It has a 1750 1920 pencil inscription inside the lid. All items are thoroughly and conservatively graded and all condition issues are noted; all items are vintage or antique and may have slight signs of gentle use. Expedited tracked parcel shipping to the U.S. starts at $19 (other spots may vary, air is higher) - tracking and insurance are included in shipping quotes. Items paid with a credit card will be shipped to confirmed addresses only. We do ship internationally. All of our prices are in $US. PLEASE NOTE: we DO NOT accept PayPal, only VISA and MASTERCARD. This is a pair of (unmarked but tested) sterling silver boot or shoe toe tips. They measure 4-3/4" around the front and they are 1-1/16" at their widest. They have holes for attachment to your footwear, and they weigh 32.7 grams. This pair is in very good condition with no bends, corrosion, losses, damage or repairs other than some scratches and scrapes from kicking stuff. Now YOU can kick 'em too. All items are thoroughly and conservatively graded and all condition issues are noted; all items are vintage or antique and may have slight signs of gentle use. Surface shipping to the U.S. starts at $6.90 (other spots may vary) - insurance is included. Items paid with a credit card will be shipped to confirmed addresses only. We do ship internationally. All of our prices are in $US. PLEASE NOTE: we DO NOT accept PayPal, only VISA and MASTERCARD. A scarce 10" restaurantware porcelain dinner plate from the dining car service of the Canadian Pacific Railway (CP or CPR). 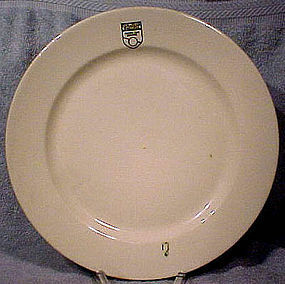 This vintage plate was made by Sovereign Potters of Canada, and it has the CP logo on the top and what may be a smudged decoration on the opposite edge. This item is in excellent condition with no chips, cracks, crazing, losses, damage or repairs. All items are thoroughly and conservatively graded and all condition issues are noted; all items are vintage or antique and may have slight signs of gentle use. Surface insured shipping to the U.S. starts at $16 (other spots may vary). Items paid with a credit card will be shipped to confirmed addresses only. We do ship internationally. All of our prices are in $US. NOTE: we DO NOT accept PayPal, only VISA and MASTERCARD. 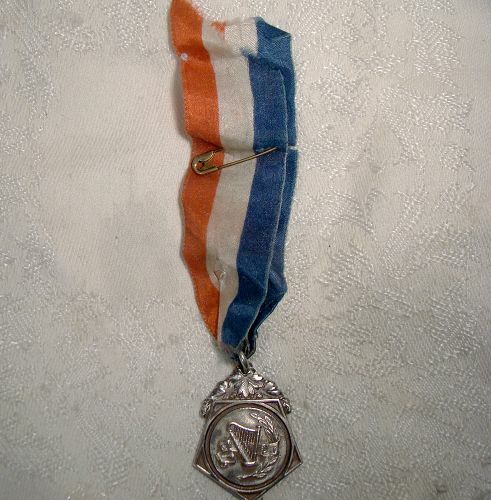 A vintage 1927 sterling silver award watch fob pendant on the original red, white and blue silk ribbon pin. This 1-3/8 x 1-1/8" singing music award has high relief music symbols on the front and the engraved dedication on the back; it says E.Y.M.C. 1927 SOPRANO SOLO 1ST PRIZE WON BY PAULINE NICHOLLS. It has the maker's mark BAILEY RD. 26 STERLING, the pin is a brass safety pin, and it weighs 10.5 grams. This item is in excellent original condition with no dents, bends, corrosion, losses, damage or repairs and the ribbon is intact and unsoiled. We haven't polished the medal as it appears to have been originally plated, and the ribbon has some folds. All items are thoroughly and conservatively graded and all condition issues are noted; all items are vintage or antique and may have slight signs of gentle use. Surface shipping to the continental U.S. starts at $6 (other spots may vary) - insured is higher, and mandatory on items over $85 if paid with a credit card. Items paid with a credit card will be shipped to confirmed addresses only. We do ship internationally. All of our prices are in $US. NOTE: we do not accept PayPal. An attractive Victorian 12-3/4" long painted silk and bone fan with flowers. 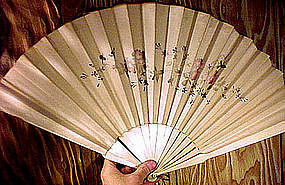 This unsigned fan is attractively painted on one side with pink flowers and leaves, and the bone supports are unadorned. This item is in very good original condition with no chips, cracks, major tears or stains, losses, damage or repairs other than some minor fraying to the silk at the ends. All items are thoroughly and conservatively graded and all condition issues are noted; all items are secondhand and may have slight signs of gentle use. Surface shipping to the continental U.S. is $8 (other spots may vary) - insured is higher, and mandatory on items over $85 if paid with a credit card. Items paid with a credit card will be shipped to confirmed addresses only. We do ship internationally. All of our prices are in $US. A sterling silver pierced hair barrette or clip measuring 1-3/4" x 1-5/8" hair barette or clip. This vintage hand made studio clip has a drop-in notch for the curved retaining strip, it is stamped STERLING with an unidentified maker's mark. It is made of substantial gauge silver, and will wear well. It weighs 7.6 grams, and it is in excellent original condition with no dents, bends, corrosion, losses, damage or repairs. All items are thoroughly and conservatively graded and all condition issues are noted; all items are secondhand and may have slight signs of gentle use. Tracked packet insured air shipping to the U.S. is $13.50 (other spots and levels of service will vary). Items paid with a credit card will be shipped to confirmed addresses only. We do ship internationally. All of our prices are in $US. PLEASE NOTE: We DO NOT accept Paypal. A Cunard Queen Elizabeth I ship tie clip 1930s. This gilt brass and celluloid 2-3/4" tie clip dates to 1938-40 and it depicts the Cunard steamship liner Queen Elizabeth I. Launched in 1938, the QEI was retrofitted for the war effort in 1940, and relaunched in 1946. She was taken out of service as a luxury liner in 1968. This clip features a 5/8" x 1/2" celluloid view of the ship, with Queen Elizabeth written below the ship, and it is in excellent original condition with no cracks, scrapes, dents, monograms, bends, corrosion, losses, damage or repairs; there is a slight patina of fine scratches visible (when looked at under a 10X loupe) on the celluloid, but these are not otherwise visible or noticeable. All items are thoroughly and conservatively graded and all condition issues are noted; all items are vintage or antique and may have slight signs of gentle use. Tracked Packet shipping to anywhere in the U.S. is $14.00 - this includes online tracking, air service and insurance up to $70. Items paid with a credit card will be shipped to confirmed addresses only. We do ship internationally. All of our prices are in $US. PLEASE NOTE: We DO NOT accept PayPal. 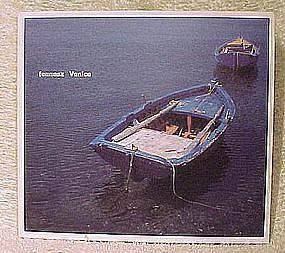 An English Touch label fold-open digipak compact disc by Fennesz, titled Venice (issued 2004). In the textural/ambient chill/electronic style, this compact disc features David Sylvian (ex-Japan) on one track. This item is in mint original condition with no flaws, losses, damage or repairs. All items are thoroughly and conservatively graded and all condition issues are noted. Uninsured padded envelope letterpost shipping starts at $2.50 (to the US - other spots may vary) - insured is higher, and mandatory on items over $100 if paid with a credit card. We do ship internationally. All of our prices are in $US. 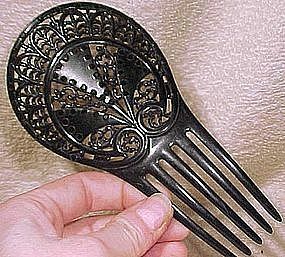 A very fine late Victorian black celluloid large hair comb with black rhinestones c1890-1900. 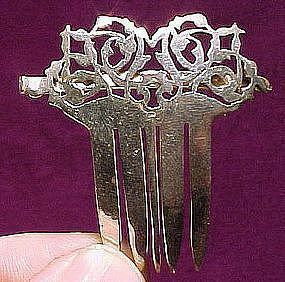 This 6-1/2" x 3-1/2" unsigned comb has nice openwork with fronds, and it is in excellent original condition with no chips, cracks, losses, damage or repairs. All items are thoroughly and conservatively graded and all condition issues are noted. Small packet surface shipping starts at $6.95 (to the US - other spots may vary) - insurance is included. We do ship internationally. All of our prices are in $US. PLEASE NOTE: We DO NOT ACCEPT PayPal, only VISA or MASTERCARD. 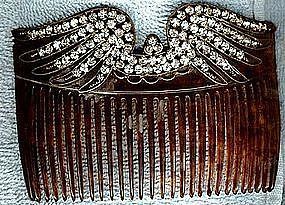 A superb late Victorian tortoiseshell celluloid hair backcomb with an opulent paste laden wings design c1890-1900. This hair accessory measures 5-1/4" x 3", and the white paste claw-set stones are mounted within gold plated wirework; this unsigned beauty is in excellent original condition with no chips, cracks, corrosion, losses, damage or repairs other than a bit of loss to the worework gilding, and all teeth of the comb are intact. Small packet air shipping to the U.S. starts at $8.95 (other spots may vary) - insured is higher. Items paid with a credit card will be shipped to confirmed addresses only. We do ship internationally. All of our prices are in $US. PLEASE NOTE: WE DO NOT accept PayPal, only VISA and MASTERCARD. A wonderfully styled vintage Art Deco pocket comb in green celluloid with a designed sleeve. This 4-1/2 x 1-1/8" comb is in a green celluloid, which has mellowed to an olive and light butterscotch brown colour. The comb has a checkerboard decoration with cream white squares on a green and copper metallic ground; the cover has black paint, subtle hand carving and gold highlights. Both pieces are unsigned, however we aren't sure if they started life together or not, although they fit together well (the decoration is different on each piece). This item is in excellent original condition with no chips, cracks, losses, damage or repairs other than the mellowing of the once bright green colour. Small packet surface shipping starts at $6 (to the US - other spots may vary) - insurance to $95 is included. We do ship internationally. All of our prices are in $US. PLEASE NOTE: We DO NOT accept Paypal.